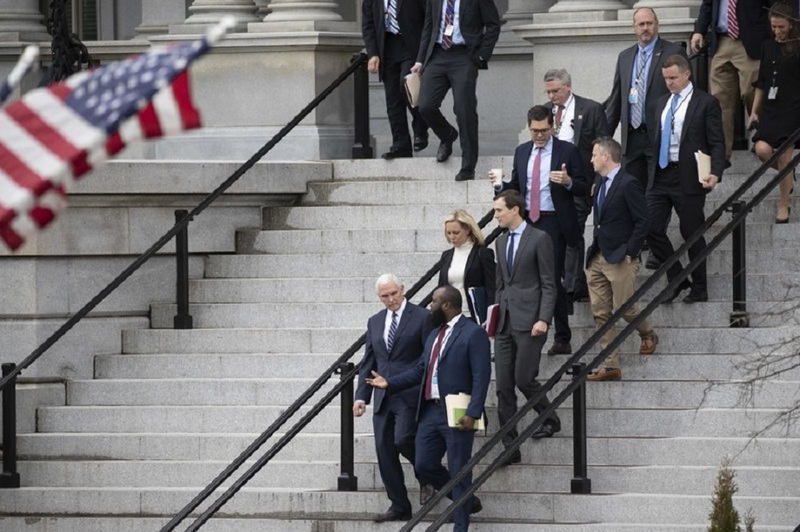 Vice President Mike Pence, left, White House legislative affairs aide Ja'Ron Smith, Homeland Security Secretary Kirstjen Nielsen, second row left, White House Senior Adviser Jared Kushner, and others, walk down the steps of the Eisenhower Executive Office building, on the White House complex, after a meeting with staff members of House and Senate leadership, Saturday, Jan. 5, 2019, in Washington. Photo via AP/Alex Brandon. President Donald Trump held out little hope Sunday that another round of talks between top aides and congressional staff would produce meaningful progress toward ending the partial government shutdown, seeming to undercut his team by saying he needed to deal directly with Democratic leaders.